Note that the 5492CPM reading mentioned above is due to sensor failure because of water infiltration. The sensor was repaired and reinstalled in September 2017. This sensor page is kept for historical purposes, the new sensor ID is 20105 and is available here. 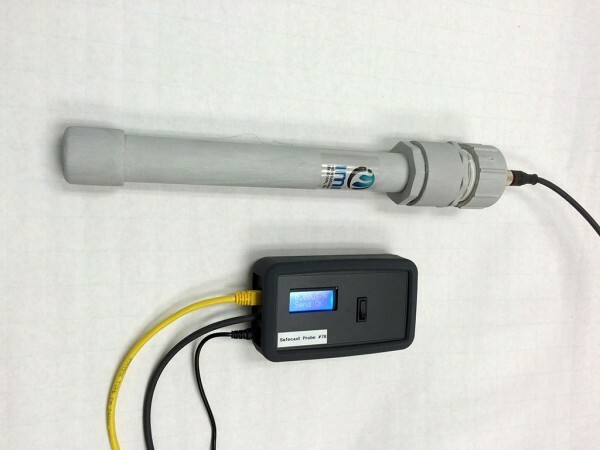 This Seawater Probe calibration is 960 CPM per µSv/hr. Geiger tube is the LND 78017. 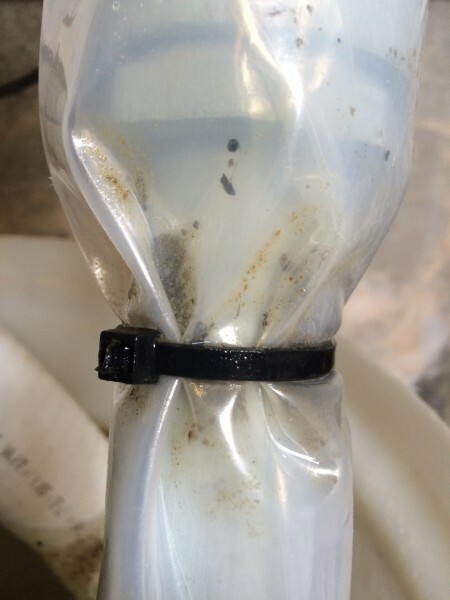 Note that CPM readings will be higher relative to North American terrestrial sensors, as the tube used for this Seawater probe is more sensitive than most. Poly-wrapped Probe in Seawater Sump. Seawater form center of a small bay circulates continuously through this sump. 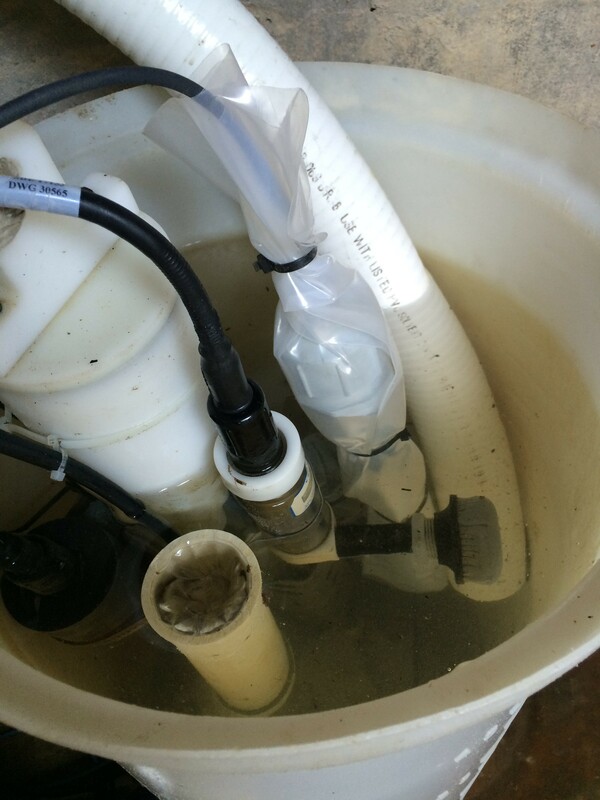 Various other sensors share the sump. Sump and Probe are cleaned periodically. Sump can fill with kelp, sand and small marine organisms, so requires cleanout, especially under rough ocean conditions. 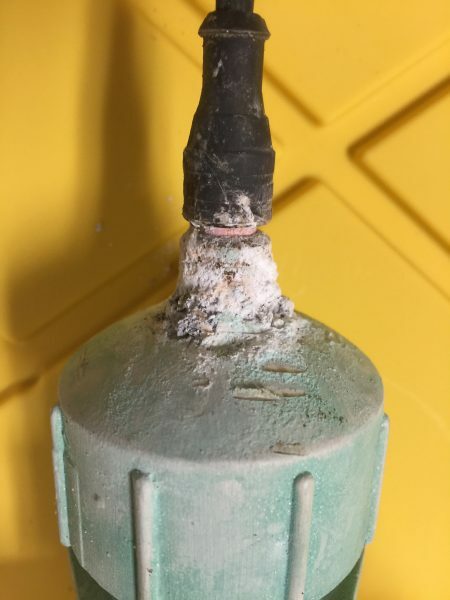 The Bodega head sensor became damaged by salt water intrusion when the connector degraded. Please see attached photo. We are going to re engineer the sensor so that this does not happen again. The high readings at the end of its life were due to noise created by the salt water intrusion and not elevated radiation levels. Why has the Bodega Marine Lab been off site for so long? We are seeing some transient spikes that we think are related to maintenance activities. I am checking with site maintenance crew. The overall background reading has been steady. Just noting that probe has been pulled by Marine Lab Staff for us to examine back at Medcom lab. In the coicmlpated world we live in, it’s good to find simple solutions. There seems to be a sporadic noise issue at the site. Will get there as soon as I can to diagnose. Ross diagnosed recent failure, which was due to router failure – possibly due to power surge at probe site. Itʻs back online. You may find the OSA screening test at MySlTepeest.com a useful tool. It provides a thorough OSA screening test and provides a very useful report that gets emailed back to the user. The building housing this probe is subject to inundation during Pacific storms. This area of California is also prone to loss of electric service each storm season, and backup power to this station may be limited. These factors may have contributed to the data drop-out around Christmas 2015. The geiger tube used here is the LND 78017. 960 CPM/uSv/hr conversion factor. Thanks Kent; I added model number next to Cal factor at top here so it remains ‘sticky’. Please post about your discovery and examination of the bump in levels beginning early July. Our host has responded and will check the installation for anomalies. Normally I do not learn article on blogs, but I wish to say that this write-up very colpelmed me to take a look at and do it! Your writing taste has been amazed me. Thank you, quite nice post. For now we are not publicizing the exact location of this sensor, while we work out a formalized agreement with the host and we get through the beta test. This is now live and the oldest portion of archived data is from testing done on dry land with a radioactive source. Weʻll be working on cleaning this up. The CPM is higher on this particular GM tube sensor, relative to the pancake detector many of us are accustomed to, due to the larger detector volume. The important data to watch with this sensor is uSv/h, which should be equivalent from sensor to sensor when measuring gamma radiation. Sea Water, being relatively dense, will rapidly absorb beta radiation. Was installed Wednesday April 22nd 2015, Earth Day!